The royal worship temple of Ramesses III at Medinet Habu is a true delight. It survives on the west bank at Luxor to a much greater degree than any other royal temple, giving you a real sense of the stately complex that has stood here for over 3,000 years. Thankfully, Ramesses III chose to build his "House of Millions of Years" out of sandstone, which largely avoided the destructive attention which impacted other royal monuments created in fine limestone. In the great Harris Papyrus, written after the king's death, Ramesses III addresses the god Amun to whom he dedicates his temple: ". . . its pylons were of stone, looking (up) to the sky, inscribed and engraved with the chisel in the great name of thy majesty." Either side of the central doorway of the First Pylon (pictured) are two large recesses which once held tall wooden flagstaffs, estimated to have reached skyward up to 36 metres. Carved beside each recess was an inscription dedicating the flagstaff to a goddess: Nekhbet, Uto, Isis or Nephthys. One of these dedications reads, ". . . . He made (as) a monument for his father Amun-Re, King of the Gods, the erecting for him the flagpole Nekhbet of cedar of the (Lebanon) range, its tip of genuine fine gold, which the Son of Re, Lord of Diadems: Ramesses III, Beloved of Amun-Re, Given Life, made for him." The sight of these tall cedar flagpoles—coloured pennants fluttering from the top—must have been stunning. Photo courtesy of M. R. Theklan. Enjoyed this article? Want to know more about ancient Egypt? 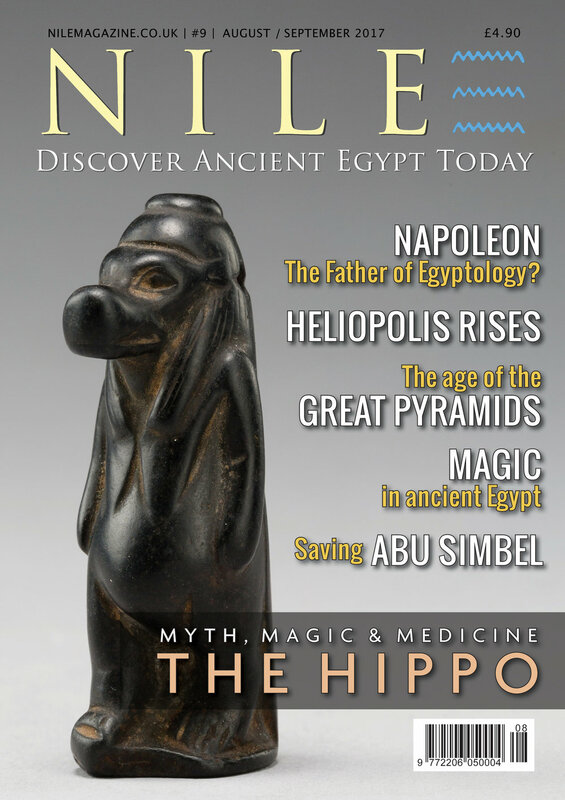 Subscribe and have every issue of Nile Magazine delivered to your door. Enjoy your Nile time!